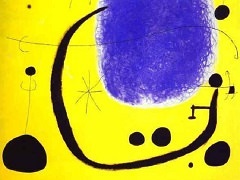 In 1925 Miro's work took a decisive turn, stimulated, according to the artist, by hunger-induced hallucinations involving his impressions of poetry. These resulted in the artist's "dream paintings," such as Personage, in which ghostly figures hover in a bluish ether. 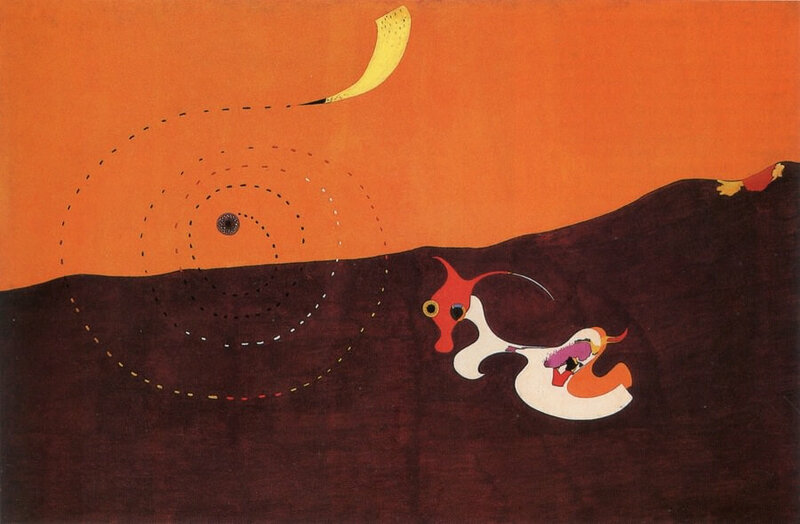 Miro explored Surrealist automatism in these canvases, attempting to freely transcribe his wandering imagination without preconceived notions. Although these images are highly schematic, they are not without references to real things, as the artist made clear. "For me a form is never something abstract," he said in 1948. "It is always a sign of something. It is always a man, a bird, or something else." In these works Miro began to develop his own language of enigmatic signs: the forms in Personage depict a large vestigial foot and a head with three "teeth" in its grinning mouth. 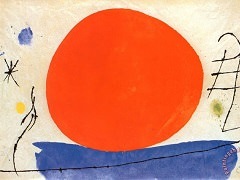 The star shape often represents female genitalia in Miro's oeuvre, and the dot with four rays symbolizes the vision of a disembodied eye. 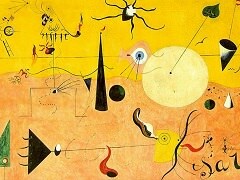 Two years later Miro reverted to imagery somewhat more grounded in reality. 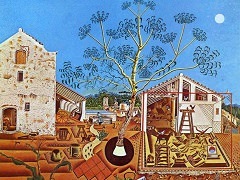 In Landscape (The Hare), among other works, he also returned to one of his favorite subjects, the countryside around his family's home in Catalonia. 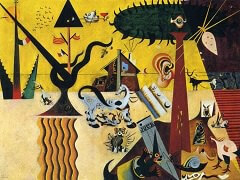 Miro said that he was inspired to paint this canvas when he saw a hare dart across a field on a summer evening. In Landscape (The Hare), this event has been transformed to emphasize the unfolding of a heavenly event. A primeval terrain of acid oranges and red is the landscape in which a hare with bulging eyes stares transfixed by a spiraling "comet." 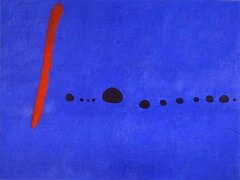 By the late 1940s Miro was making canvases on a much larger scale and with broader markings. Painting of 1953 is more than 6 feet high by 12 feet wide and is characterized by loose, gestural brushstrokes and stained pigments. The calligraphic drawing style and open field of works such as Personage has, in Painting, metamorphosed into bold, energetic lines in a vast, cosmic atmosphere. Yet the star and sun, the animal-like forms, and the sprays of dots are signs of the artist's symbolic language developed in the 1920s.